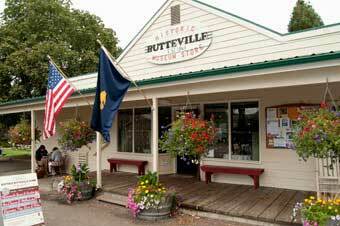 The Historic Butteville Store is the oldest continuously-operating retail establishment in Oregon. It is now owned by Oregon Parks and Recreation Department (OPRD), and operated in conjunction with Champoeg State Park. The Store has gone through many iterations over the years, from community general store, to local recreation center, to its current role as a specialty food store and café serving the local community and State Park visitors. You’ll find hand-dipped ice cream cones, deli sandwiches, drinks and a small offering of camper-specific food products. Learn about the rich history of the store below. The Store is closed for the Winter, but open on the First and Third Saturday evenings for Dinner and Live Music. Call 503.678.1605 for reservations or more information. 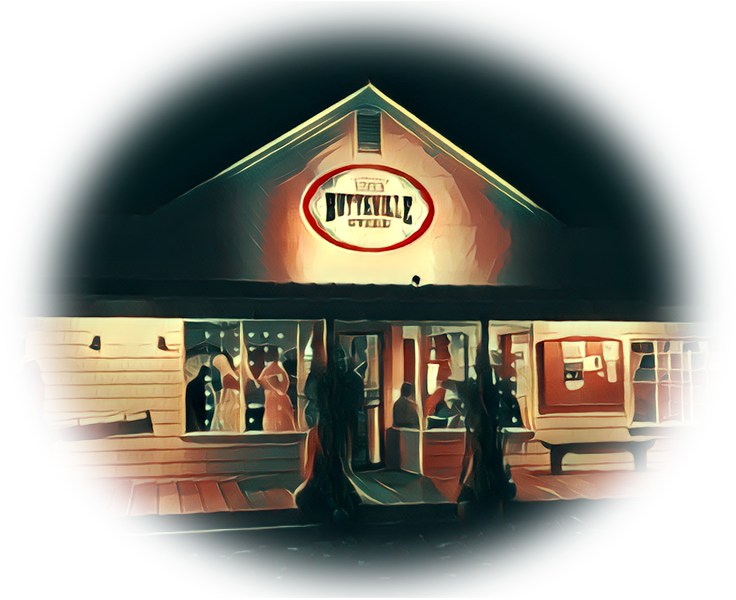 The Historic Butteville Store features live music and dinner service on Saturday nights April through September. Three course dinner and live music is $25 per person. Wine and beer available for purchase. Limited reservations available. Dinner seating begins at 6:00 PM. To stay current with Store activities and to join our mailing list check out our Facebook page. You can check out the entire 2018 live music calendar below. 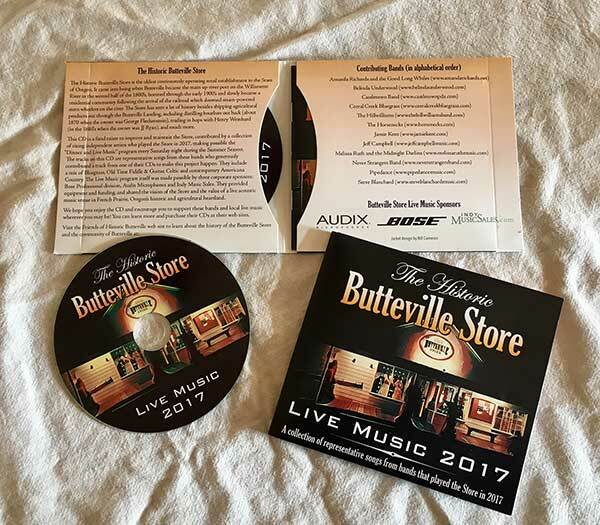 Now you can take live music from the Historic Butteville Store with you. Order your CD of selected performances from the 2017 Season, just $15.00 (plus $1.00 shipping and handling). 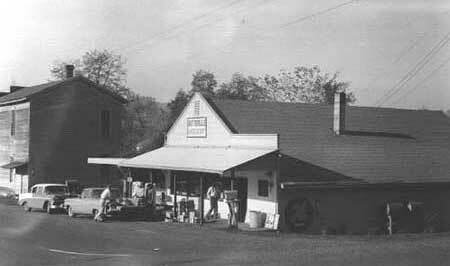 The Butteville Store has had a long and colorful history. The Store sits on an original Donation Land Claim belonging to Alexis Aubichon, probably filed in 1851. Aubichon sold the property which contained a “dwelling,” that became the first mercantile store. That store and property were eventually acquired by Henry C. Fleckenstein in 1870 or so. 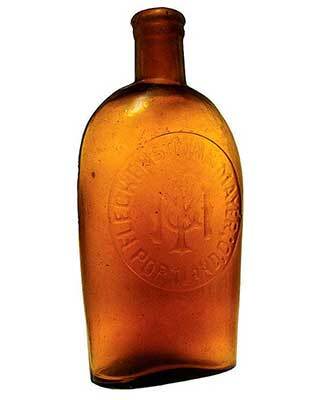 Fleckenstein was not just a merchant, but a distiller and began distilling Bourbon whiskey behind the store in what was locally referred to as “still flats.” Enter Joseph J. Ryan, who immigrated from England in 1871 and either began working at the store or rented or leased it. 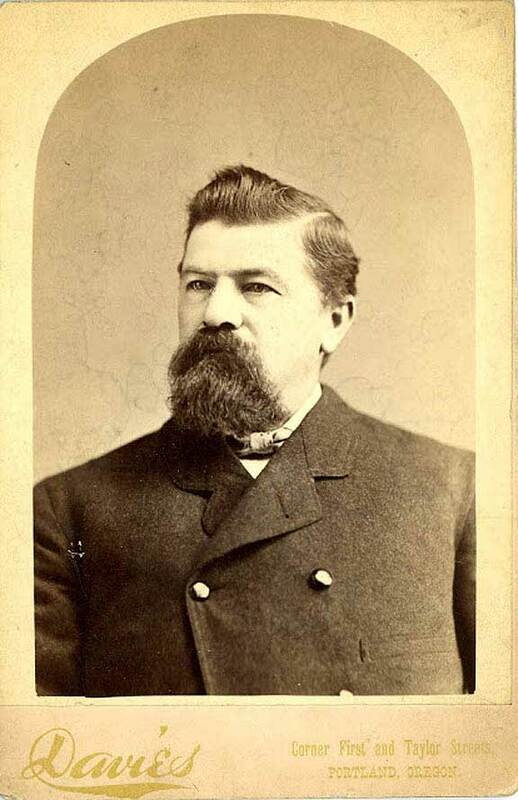 JJ Ryan became the prominent local merchant associated with the Store and the community. 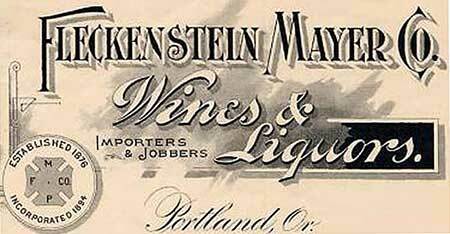 We surmise that JJ Ryan purchased the store when Fleckenstein left Butteville for Portland to form a new business called Fleckenstein & Mayer Wines & Liquors. JJ Ryan probably entered into a long term note to purchase the store with a $150 down payment, and assumed title when the loan was paid off. The ownership deed was confirmed with registered documentation of the sale in 1887. George Fleckenstein was a German immigrant, and Fleckenstein & Mayer was a successful business: as late as 1920 it was listed as a business in Portland. Portrait of George Fleckenstein and one of the highly collectible historical bottles in which Fleckenstein & Mayer bottled and sold their Bourbon whiskey—there are only six known amber colored flasks in existence. J.J Ryan became one of Butteville’s most prominent citizens. His store sold tobacco and general provisions, and he dealt in grain and hops, etc. 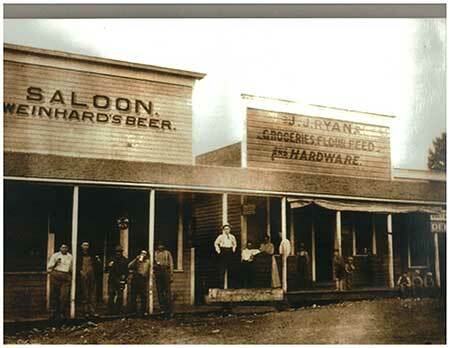 He and his son “Josie” constructed a saloon on the north side of the store, selling Weinhard beer. Henry Weinhard’s brewery was also a customer, buying local hops from JJ Ryan. In 1876 Ryan purchased a large farm south of town made up of portions of the donation claims of Willard Rees and the Reverend Michael Fackler. He and his wife Mary Rose (daughter of Peter Feller) farmed for many years They also built the Ryan House which is located in Butteville on the corner of 2nd St and Union just one block from the store and which is still standing. JJ Ryan was the longest owner of the Butteville Store, holding it until his death in 1929, when it passed to his wife. 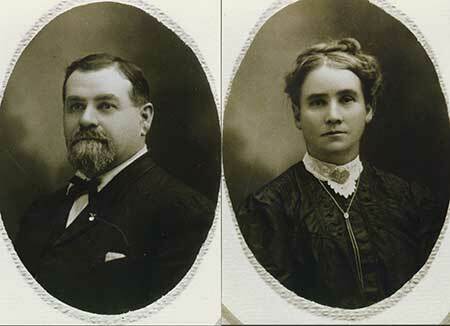 Joseph J. and Mary Ryan, long time owners and operators of The Historic Butteville Store. At some point as he aged, JJ Ryan turned over operation of the Store to his son Josie. The photograph below of Butte Street in 1910 shows the “Josie Ryan General Merchandise” right next to a Salon selling “Weinhard Beer.” It gives a clear impression of downtown Butteville just as the economics of the town were changing with the arrival of the railroad nearby and the looming end of the stern-wheeler days. 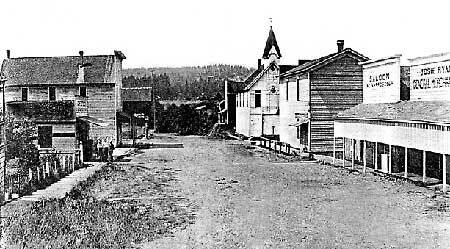 Butteville Street looking north to the river in 1910. Note the Store operated as the Josie Ryan General Mercantile. North of the store is a saloon, and north of that is the Odd Fellows Hall (later the Willamette Trading Co.). The white Church building has a Masonic symbol on it because the Masons met on the second floor, and north of that is a commercial building that was owned by F.X. Matthieu. Across the street from the Store (just visible) is the edge of the Butteville Hotel, and north of it the vinegar factory (now a garage), and north of that an unidentified two story building. With the arrival of the railroad in French Prairie and the end of stern-wheeler shipping on the river, the Butteville Store transitioned into general store and the Saloon north of the store probably was removed during Prohibition — it is now the patio and lawn north of today’s Butteville Store. The estate of Mary Ryan sold the store in 1943 to Dossie and Eve Green, the first of eleven owners over the next fifty years. 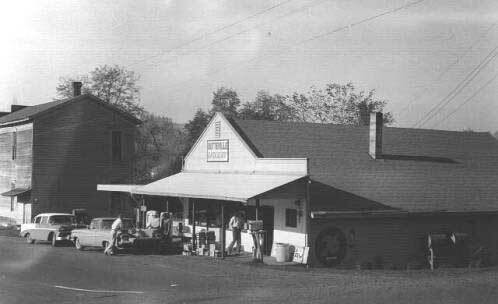 By mid-century the Store was also supporting the community and recreational customers going to Champoeg State Park or to boat on the river—at that time there was still access to the river on Butte Street down to Butteville Landing. 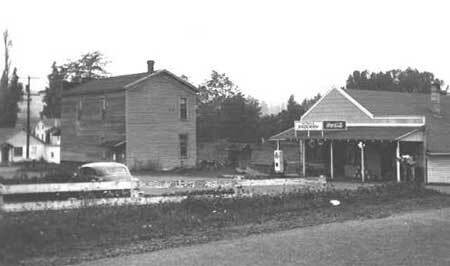 In the early 1960’s, the store sold gasoline and general merchandise. After it was donated to Oregon Parks and Recreation Department in 1999, it continued as a small store and café, included an art gallery at one time, and most recently has operated as a small store and community center in the town of Butteville.